Moon gardens contain plants with pale flowers -- especially whites -- and silvery or variegated foliage that shine in moonlight. Some gardeners plant moon gardens to glow from afar when peering into the dark through a window. In moonlight, whites seem to light up as the reds, oranges and purples of flowers that add drama to daytime viewing fade into darkness. Other gardeners design moon gardens for nighttime rambles and include plants with fragrant flowers like night-blooming jasmine (Cestrum nocturnum) and tobacco plant (Nicotiana). Salvias (true sages) don't typically appear in lists of plants for moon gardens partly because sages seldom have fragrant blossoms. It takes sunlight -- or fingers crushing leaves -- to release the fragrance of their foliage. Yet a number of white-flowered sages would be excellent additions to the dreamy design of a moon garden. 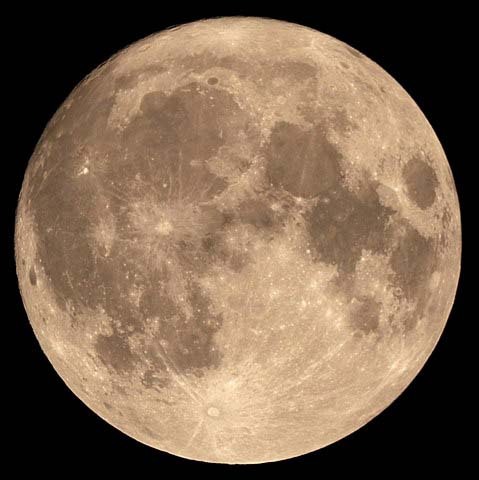 Before we offer suggestions, let's ramble briefly through the origins of moon gardens. Agra, India. Between 1631 and 1648, Mughal Emperor Shah Jahan built the Taj Mahal, a gleaming white mausoleum on the north side of the Yamuna River in Agra. Historians are uncertain whether he constructed it to honor his wife, Mumtaz Mahal, or as his own tomb. To the south, across the river, is the Moonlight Garden (Mehtab Bagh in Persian), which archaeologists and ethnobotanists excavated in the late 20th century. Mehtab Bagh was in a flood plain and eventually became covered in deep silt. Along with the plantings, the muck submerged structural elements, such as walkways and marble arches from an entrance pavilion. Botanists discovered evidence of fragrant trees, including Jujubes, which produce an apple-like fruit. It may be that the structures, more than the plants, were white and that Mehtab Bagh was a pleasure garden intended to focus eyes on the Taj Mahal glowing in moonlight. Indian Hill Farm, West Newbury, Massachusetts. In 1901, Alice Morse Earle described the moon garden of Indian Hill Farm in her book Old Time Gardens: Newly Set Forth. She noted that in 1833, Benjamin Poore planted two massive beds of white flowers, each 700 feet long. "Indian Hill in June is a very close neighbor to Paradise," Earle wrote. Among the white flowering plants she observed were almond trees, candytuft, honeysuckle, jonquils and spireas (bridal wreath shrubs). It seems that Poore was obsessed with the gleam of white, because Earle noted reports that during his life the farm also was home to "vast herds of snow-white cows" as well as a white dog and white pigeons, poultry, peacocks and sheep. Sissinghurst Castle, Kent, England. Many sources cite Vita Sackville-West's moon garden at Sissinghurst Castle as being the most famous in the world. Sackville-West devised a design based not only on white flowering plants but ones with gray-green foliage, which brighten in moonlight. Her plantings included wormwoods (Artemisia) and silvery mounds of yellow-flowered cotton lavender (Santolina chamaecyparissus). Tiny, white, moisture-conserving hairs are what make foliage look gray-green or silvery. Some gray-green plants often cited as moon garden choices include lamb's ear (Stachys byzantina), dusty miller (Senecio cineraria) and Velvet Centaurea (Centaurea gymnocarpa). They're good companions for Salvias. Flowers by the Sea raises a number of gray-to-silver Salvias, including the groundcover Bee's Bliss Sage (Salvia x 'Bee's Bliss'). We also grow a number of sages with white and pale-yellow flowers. Tree Sage (Salvia arborescens) is one example. It is a white-flowered variety and is one of the few sages with fragrant blossoms. 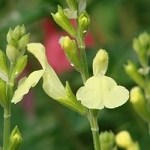 Salvia arborescens is one of our suggestions in the following list of FBTS moon garden plants. It is rare for more than its tree-like height and fragrance, because moths are its primary pollinators. Bees, butterflies and hummingbirds pollinate almost all Salvias. S. arborescens is the first sage ever documented as being night-blooming and moth-pollinated. Botanical researchers Martin Reith and Scott Zona last December published their report about its unusual characteristics in Neotropical Biodiversity. You can read it here. This is one of our Special-Order plants grown at your request. Production takes six weeks minimum from date of order. Mexican Bush Sages bloom profusely and have gracefully arched forms. Scarlet Sage comes in many colors other than red. This FBTS hybrid is the first tall, white-flowered variety. Although drought resistant, Waverly grows best with average watering based on local precipitation. Jame Sages are crosses of Autumn Sage (S. greggii) and Mountain Sage (S. microphylla). This one is an FBTS hybrid. It's rare to find such a true white among the Jame Sages. This is another FBTS hybrid. Our staff at FBTS is always glad to help brainstorm garden designs and landscape solutions. Please contact us with any questions you may have. Our plants will help brighten your garden by day or night. I love the salvia's that I received! They were beautiful, healthy and in-bloom. I will buy more in the future.